Gill, Graeme 2018. Collective Leadership in Soviet Politics. p. 31. Gill, Graeme 2018. Collective Leadership in Soviet Politics. p. 1. Fortescue, Stephen 2016. Russia's “turn to the east”: a study in policy making. Post-Soviet Affairs, Vol. 32, Issue. 5, p. 423. Frame, Murray 2013. State Expansion and the Criminal Investigation Militia during the Russian Civil War. History, Vol. 98, Issue. 331, p. 406. Fortescue, Stephen 2010. Russian Politics from Lenin to Putin. p. 21. Fitzpatrick, Sheila 2010. Russian Politics from Lenin to Putin. p. 51. Fortescue, Stephen 2010. Russian Politics from Lenin to Putin. p. 1. Huskey, Eugene and Rowney, Don K. 2009. Russian Bureaucracy and the State. p. 111. Burrage, Michael 2008. Class Formation, Civil Society and the State. p. 49. Turton, Katy 2007. Forgotten Lives. p. 82. Rees, E. A. 2004. The Nature of Stalin's Dictatorship. p. 19. Watson, Derek 2004. The Nature of Stalin's Dictatorship. p. 134. Gooding, John 2002. Socialism in Russia. p. 62. Conroy, Mary Schaeffer 2000. Health Care in Prisons, Labour and Concentration Camps in Early Soviet Russia, 1918–1921. Europe-Asia Studies, Vol. 52, Issue. 7, p. 1257. Watson, Derek 1998. STO (The council of labour and defence) in the 1930s. Europe-Asia Studies, Vol. 50, Issue. 7, p. 1203. Slavin, Morris 1996. Comparing ‘old’ and ‘new’ on Lenin: A review article. Europe-Asia Studies, Vol. 48, Issue. 7, p. 1219. BREUER, STEFAN 1992. Soviet Communism and Weberian Sociology. Journal of Historical Sociology, Vol. 5, Issue. 3, p. 267. Conroy, Mary Schaeffer 1990. Abuse of drugs other than alcohol and tobacco in the Soviet Union. Soviet Studies, Vol. 42, Issue. 3, p. 447. When Lenin and his fellow Bolsheviks seized power in 1917 they sought to scrap the existing structures of government and substitute new ones based on Marxist principles. 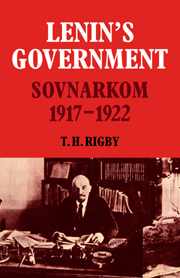 This book attempts a detailed account of their efforts to create a socialist 'cabinet' (Sovnarkom), to elaborate effective machinery and methods of operation, and to use it to govern the country. It examines what kind of people were appointed to Sovnarkom and who chose them. It shows how elements of the pre-revolutionary system of government were taken over along with former ministerial officials. Sovnarkom was headed by Lenin and this helped to ensure its early pre-dominance. Nonetheless it was gradually overshadowed by the Party Central Committee and Politburo, and the book seeks to explain why this happened and why Lenin's efforts to reverse the process failed. The book throws important light on the origins of the Soviet system of government.